UK: Carrillion has won the contract to design, supply and install the high-voltage onshore transmission system for the Dudgeon offshore wind project. The British infrastructure firm will build the 47-kilometre 132kV connection from landfall near Weybourne to Necton in Norfolk. 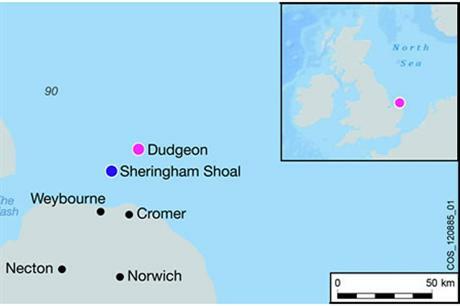 The system will connect the subsea cable, which will transmit the power from the offshore wind turbines to shore, to a new National Grid sub-station. Work on the cabling will begin later this year, and is due to be completed in 2016. The 402MW project is to be built in the North Sea by Statoil, Statkraft and Masdar. Offshore construction is due to start in 2015, with commissioning set for 2017. It will be made up of 67 Siemens 6MW turbines. The German manufacturer has also been handed the contract to handle the offshore connection.